green tea | Hot vegan chick.....peas! 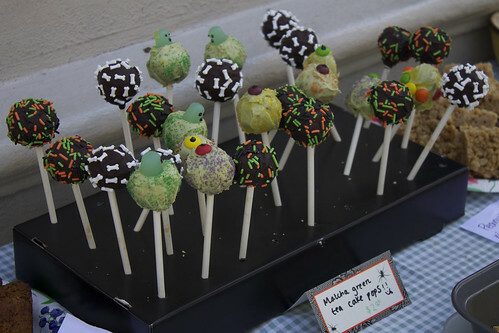 MoFo #6: Vegan cake pops! I’ve fallen behind in my MoFo posts but rest assured I’ve definitely been keeping busy in all things vegan! This weekend I participated in a vegan bake sale to raise money for the Bay Area PPK team (link provided in case you want to donate! hint hint!) in the Walk for Farm Animals. I’ve been scheming and dreaming all week what goodies to bring. I especially wanted to make something that would appeal to kids, since I always make stuff geared towards an adult palate. When I worked at Legoland one of my jobs was to make marshmallow pops, which I thought were the most disgusting, revolting things ever and would never sell. Guess what! The kids LOVED them. Impale 3 stale marshmallows on a stick, dip em in chocolate, and roll them in rainbow sprinkles and you’ve got an instant hit! I’m sure parents hated us (esp since the damn things cost $5!). I considered making the vegan equivalent for the bake sale but Dandies are just too gummy for my preference and Sweet and Sara are ridiculously expensive. I settled instead on cake pops, which I had never heard about until a few months ago. There’s an entire book of them at Borders and my facebook feed has been flooded with pics from crafty friends making their own pops. 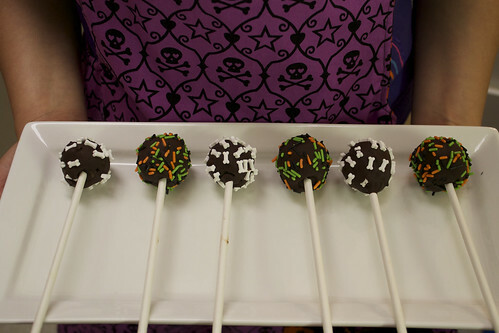 There are lots of sites with info on cake pops, including Bakerella’s page where I think they originated. There aren’t lots of vegan variants though and everyone seems to use cake mixes and canned frosting so I thought I’d give my take on how to make vegan, homemade pops. They’re kind of gross but oh so delicious. As a side note, Duncan Hines cake mix and frosting are vegan but they’re loaded with partially hydrogenated oil so be aware before you buy! Start out making your favorite cake or cupcake recipe (cupcakes cool faster)! I wanted to avoid using a lot of food dye so I settled on matcha green tea cupcakes and frosting from Vegan Cupcakes Take Over the World. I envisioned making creepy green monsters and eye balls (which didn’t actually happen) and matcha provides an excellent hue! I was a little worried kids wouldn’t go for green tea but I think the flavor was mild enough that they didn’t care. After they’ve cooled, use your fingers to break the cakes into fine crumbs. 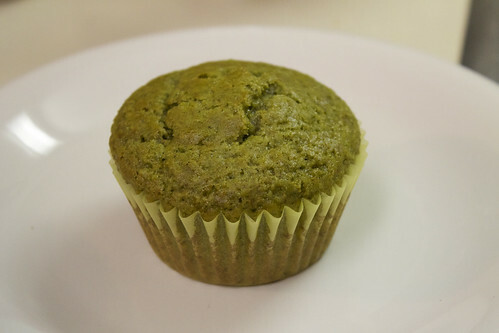 Then add an entire batch of matcha green tea frosting from VCTOTW and mix well! The frosting should be fairly thick so when you’re making it, go easy on the soy milk and add more powdered sugar, if necessary. Be gentle when combining the crumbs and frosting. I used my hands to mix everything into a sticky dough because I didn’t want to turn the cake into goo. You’ve added enough frosting when you can form the mix into balls of dough that will hold together. 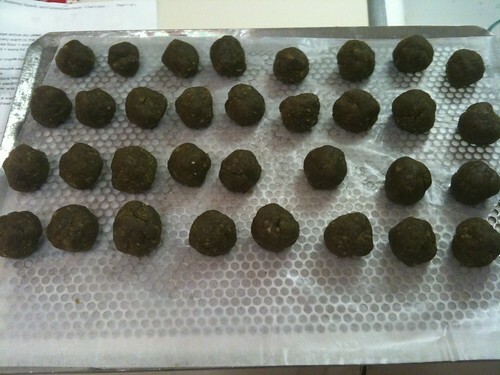 Once mixed, roll the cake mix into quarter-sized balls, cover them with plastic wrap, and chill them on a cookie sheet lined with wax paper. I did this in the fridge overnight, but things dried out a bit so maybe a few hours in the freezer would be better! One batch of cupcakes + frosting made about 35 balls. a) They’re cheap and decent quality chocolate! Only $2.50 for a bag (compared to almost $5 for Ghirardelli! )…and you will need an entire bag! I’m not sure if they’re fair trade, sorry. b) A lot of chocolate melts badly in the sun but the pops made from 365 chocolate were champs and did not turn into sad little goo balls even after many hours in pretty strong sun. Yay! To keep the pops on the sticks I discovered you’ve got to dip the stick end in chocolate before insertion and then chill the undipped pops in the fridge 15 min to let everything set. Otherwise you’ll end up with cake balls falling off sticks into chocolate. Disastrous! Plus you’ll have to eat all the broken ones. Boo hoo. After a quick sprinkling of Wilton’s (accidentally vegan) sprinkles and about 30 min chilling upright in the fridge, you’re rewarded with these little gems! I made a second batch of green tea frosting to cover the rest of the pops. Again, I put a little frosting on the end of the stick before putting it into the cake so the thing would be sturdier. Then I just covered it in frosting and colored sugar! I used some Skittles and black frosting to try to make eye balls and I also found some Halloween ghost Dots that I painted little ghost faces on. I think they came out pretty cute! And guess what…kids loved them!